So I'm going to cheat this week (because it's been a long week and it's only Wednesday) and post both my Gotta Love It item and the Before & After pictures of William's new room. The two are related so it works out nicely. Now stupid, stupid, stupid me forgot to take a before picture. I'm sure I have a great shot of William as a newborn on his changing table but I have all those pictures archived on CDs and I don't really have the time to dig through them for the sake of comparison. So, you can either check out the best before picture I could find below or you can click here to view a video that shows the previous layout of the room. As a bonus the video is pretty funny. Don't want to click on the video? Ok, here's the best picture I could find. Ignore the scary face William is making and focus on the room. So you can see we've got a changing table to the left (the very same changing table my mom used for me!) and then a bookshelf angled in the corner. And on the opposite wall is a rocking chair and his crib. The crib I love! It was a steal. It's a Pottery Barn crib that I bought used from a friend for $200; mattress and all. But one of the biggest things that bothered me about William's room from the get go was that none of the furniture matched. Do you likey? As you can see the room looks more cleaned up and just a lot more put together. And you won't believe the price tag. We only put in $169. The rest are items we already had. 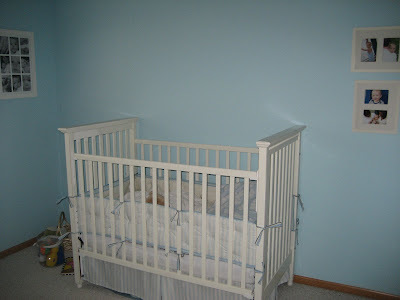 The one dilemma I'm having (and maybe you can help me out) is what to do with the wall space above the crib. To me it looks a little bare. Am I right? But if so, then what do I put there? I used to have that long picture frame you see off the left above it. 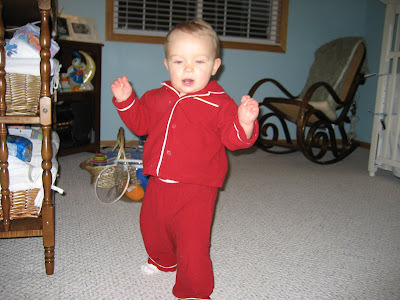 But clearly when I made that decision I never believed William would grow to the height he is now. There's been a couple close calls when he's nearly pulled it down on top of himself so we just had to move it altogether. So I'm not really sure what would help fill it in but won't cause curious hands to want to yank it down. I'm open to your suggestions. So back to my Gotta Love It item. It's the dresser! Check out my bargain hunting skills on this bad boy. I first spotted this on target.com. I knew it would be perfect because: (1) it's white (2) the dimensions fit perfectly, and (3) I love the cabinet space for storing diapers, wipes, etc. It was listed at $319 which was well within our budget but I ran into a snag when I found out that this item could only be purchased online (no pickups or in-store purchases allowed) and it would cost me $200 to have it shipped. I thought this was ludicrous. If I wanted to spend more than $500 on a dresser I could have easily found a better quality piece at a furniture store. So I called Target and was lucky enough to be able to talk to one of the most helpful customer service reps in the history of customer service. He understood my dilemma and helped me track down the manufacture, the UPC code and even a website and phone number. 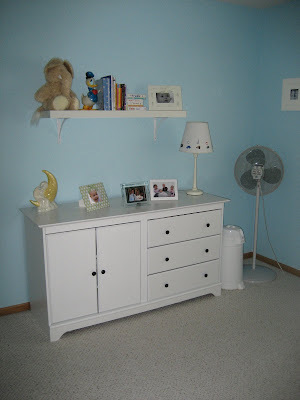 I contacted the manufacturer and they were able to do a local search for this item and found that this dresser was available at ShopKo in River Falls, WI for only $219! So one day after he got home from work, I dragged Brian into the car and we drove to River Falls (about 20 minutes from our house) to pick up the dresser. Much to our surprise ShopKo only charged us $155 (including tax) for the dresser. So I went from over $500 at Target (when you include the shipping) down to $155. Now if that's not a bargain hunter's dream than I don't know what is. And I should probably mention that besides the price, the product is pretty good too. It took a little while to assemble but that was expected. All in all we're so thrilled that the room turned out. Every time I walk in there it's like I'm in someone else's house. And I guess that's what will have to get me by until we can sell and get something just a tad bigger. I plan on getting these for the girls' rooms...I think they are a little cheaper than pottery barn. How Nice Has the Weather Been? What a Grand Old Day!